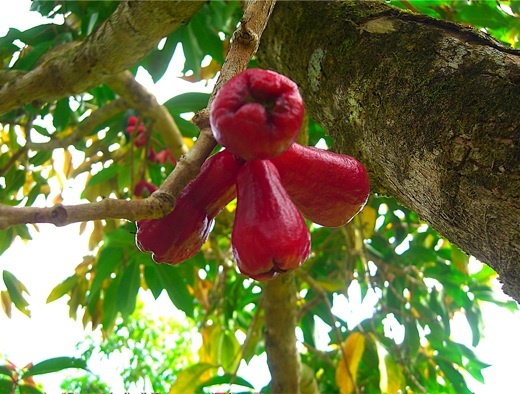 SUBHEAD: This fruit was one of the original canoe plants brought by Polynesians to Hawaii. Since coming to Hawaii, I have often enjoyed mountain apples. They are a red, elongated pear shaped fruit, juicy and slightly crunchy, with a soft skin and delicate flavor. I have purchased these at the farmer’s market, or been given surplus fruit by neighbors. Recently, a friend gave me a mountain apple tree to plant. So I began to research this species. 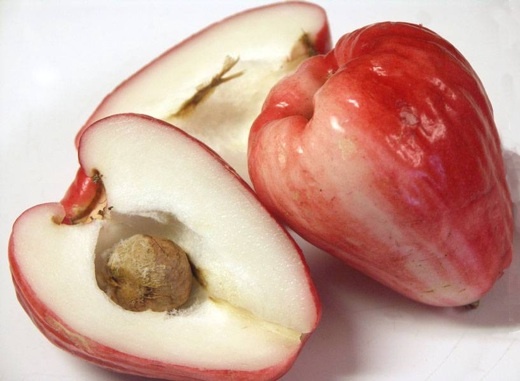 I always thought this fruit, which is also called the Malay Apple, was brought here from Asia, after Western Contact. I was surprised to discover that it is a canoe plant, with a Hawaiian name, Ohia ai. Canoe plants were brought by ancient Polynesians who traveled by canoe to settle in the large Polynesian Triangle that spans from New Zealand to Hawaii to Rapa Nui (Easter Island). These travelers brought a package of food plants and animals to sustain them in their new homes. The scientific name for the Mountain Apple or Malay Apple is Syzygium malaccense. It is native to Malaysia, and spread through Southeast Asia and the Pacific Islands. It was brought to the Americas from Polynesia by Captain Bligh. 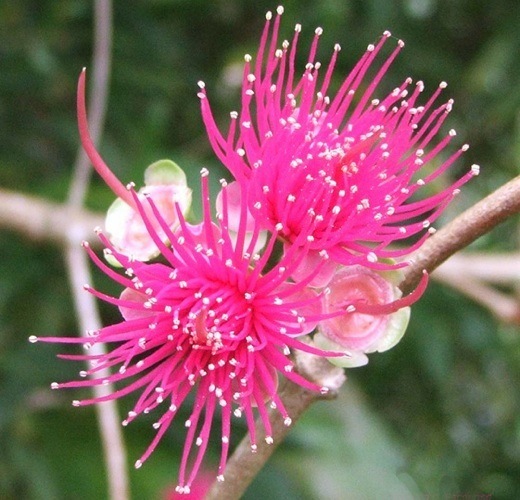 The tree is of the Myrtaceae family, and is related to the Java Plum, Guava, Eucalyptus and Surinam Cherry trees. The Ohia ai or Mountain Apple tree can grow to 50 feet. The tree begins to fruit after 7 years. The bark is mottled gray and smooth, and the leaves are shiny dark green ovals. Blossoms come in the spring, and are bright pinkish red tufts that look like pompoms, with nectar that attracts birds and insects. The fruit forms all along the branches and trunk, rather than from the ends of branches. It ripens in about 3 months, in late summer or early autumn. The fruit is red or can be pinkish, with white flesh and a brown seed. The Ohia ai is a tropical tree, and can be found growing wild in mesic lowland forest, shady mountain valleys up to 1800 feet, or the humid windward areas of the Hawaiian islands. Hawaiians traditionally used all parts of the Ohia ai. The wood of the trunk was used for house rafters and posts, and for carving statutes. A dye from the roots and bark were used for coloring tapa cloth. Parts of the tree were used medicinally. A tonic from the leaves and bark was used by new mothers to help expell the placenta after giving birth. The bark was also used in tonics for lacerations, mouth lesions, and thrush. Bark was chewed to help a sore throat, and leaves chewed for treating bronchitis. Eating large amounts of the fruit can cause diarreha. There is a Hawaiian saying, “O Hinaia‘ele‘ele ka malama, ‘aluka ka pala a ka ‘ohi‘a”, meaning Hinaia‘ele‘ele is the month when the mountain apples ripen everywhere. Hinaia’eleele is the month that falls during July or August, when the rains begin to return after the hot dry summer. Another reference to this time is “Olelo Noeau, Pukui: Ka ua ho‘opala ‘ohi‘a”, the rain that ripens the mountain apples. This refers to the rain that comes just as the mountain apple is beginning to ripen. The ripe ohia ai was also a metaphor for human beauty: “ ‘Ohi‘a noho malu”, Mountain apple in the shade. Said of a beautiful or handsome person, who is compared to a mountain apple that ripens to perfection in the shade. Another reference to beauty is one to the moon goddess Hina, “Nawele ka maka o Hinaulu‘ohi‘a”. Pale is the face of Hinaulu‘ohi‘a. Said of the pink rim around the blossom end of the white mountain apple. The red fruit of the Ohia ai is associated with Pele, Fire Goddess of the Volcano. The fruit is often used to decorate hula altars, and is used ceremonially in Tahiti. We will be planting our Ohia ai tree soon. While waiting the seven years for it to bear fruit, I will continue to look for Mountain Apples at our local weekly Sunshine Markets during the late summer season here on Kauai, to experience a refreshing taste of Ohai ai. Did you ever plant your tree? I have some questions. Ours is just starting to get blossoms! Mahalo! Yes we planted the tree not long after this article was posted. It's beautiful tree about 20 feet tall and needs to be topped a second time. By the way the tree is about 20 feet from our beehive, so the bees have had a chance at it. Last year was the first time the tree bore the bright magenta pompoms. Fruit soon followed. This year the double-pumped. Back in February it put out some flowers and developed a few fruit. But now it's going off again - with a tree load - more than we can eat or likely give away. If your tree has blossoms I would guess fruit are on the way. How long after the blossoms form can you expect fruits? Blossoms come in the spring, and are bright pinkish red tufts that look like pompoms, with nectar that attracts birds and insects. The fruit forms all along the branches and trunk, rather than from the ends of branches. It ripens in about 3 months, in late summer or early autumn. I've been looking on Google for info about this and wondering if you can answer it. Can a mountain apple tree grow from just planting the seed found in the fruit? I was given a bagful of the fruit that I simply love! I'm not into gardening so I'm not sure if special preparations need to be done to do this. Thanks in advance for your help. We don't sell mountain apples. I am not sure where you can buy them in bulk. Craigs List has some offers for mountain apples in Hawaii, you could try there. Yes, you can grow a mountain apple from seed, that is how we got ours. You can also air layer a cutting onto another tree. i am from india kerala state,my papa planted before 20 years.now total 15 trees here,good taste and flower. $110 Oil Coming Our Way? Don't audit Fed! Pull the Rug!